We have great news on the Combined Debt Payoff!! The third family is on their FINAL debt ~ a student loan for $33K and their van was just paid off! 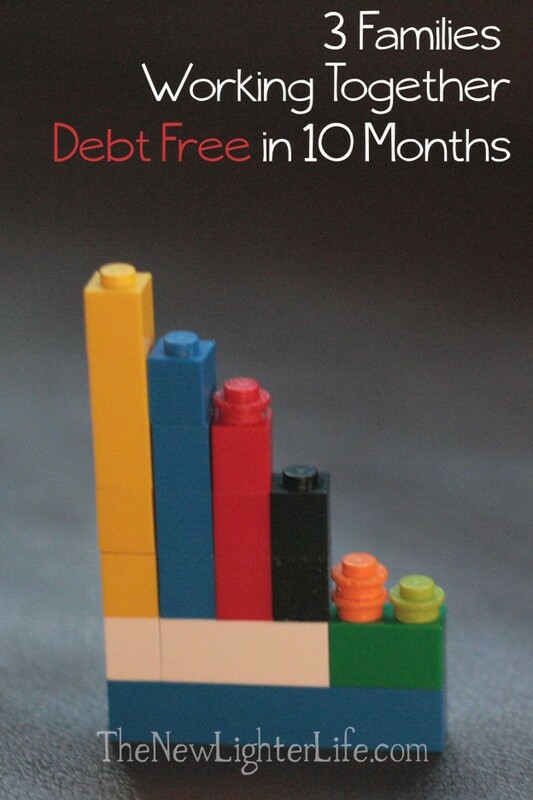 So far, all 3 families have paid about $31K in debt for the past 7 months! That’s a whole lot of moolah! Some may ask how this all works out so well? Accountable. All 3 families are close friends, we see each other on a regular basis (at least weekly). We’re not out buying new cars or anything and we’re respecting one another to stick to the plan. Disciplined. This is the “just like you” part of the post. I will say that Mark and I are LEARNING to be disciplined with our money. Because of our downsized life, we have extra money we intended to put toward the debt. But several things have come up, unexpected trips, van repairs, camper freeze issues, needing new jeans because of post baby body. Little by little the extra cash has trickled away. We are motivated and rejuvenated and making better decisions. * One thing I’ll say works better for us is that we have been consulting our financial advisors friends about more of our money decisions. (And let me just say that there are some HUGE ones in the works that I’m very excited about but refuse to spill the beans just yet). Committed. We each look at the $800/month contribution as a bill. A non-negotiable bill. We’re committed to seeing everyone debt free and by golly it’s happening. Motivated. We’re in this together and we see debt melting away at a much faster pace than if we were to do this on our own. That is motivating friends. I cannot tell you how unbelievably blessed we are to see burdens lifted and doors open because of the debt being gone. Aside from our monthly contributions to the debt, our next big pay down will be with the tax returns. Come on W-2’s and bank statements!! We’re hoping to get $10K between the 3 families so we can knock the final student loan way down. We had some things fall through at the end of year as far as extra income. That along with the extra $3K on the student loan adds 2 more months onto the payoff (the 10 month plan). But on the bright side, we had originally planned for 15 months. All this to say, we couldn’t be happier with where everything stands and see light at the end of the tunnel. We welcome any questions about this whole debt thing. The response has been overwhelmingly positive and we appreciate the support. We’ll update on the debt as things change. Thank you for the support!